This is mainly for family members, so I won’t mind if other readers move on to something else. So the folks can see what kind of place Leive & I moved into last December, here is the second in a series of pages featuring photos of the house. 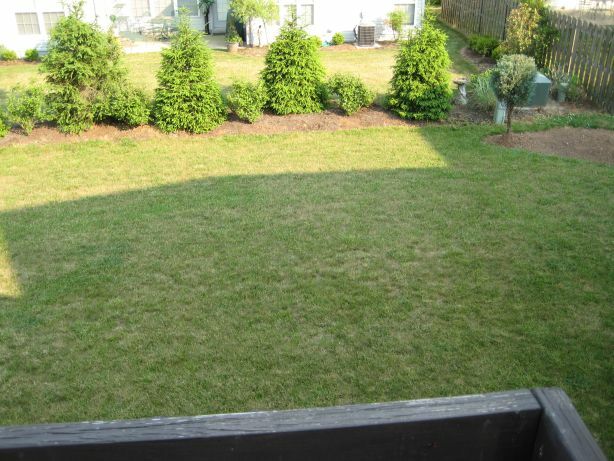 This time I don’t have as much to show, just some views of the backyard as seen from the patio. I chose not to put them with the pictures in Part I because I’ve got ten photos there already, and didn’t want to further slow down the load time for those with dial-up connections. 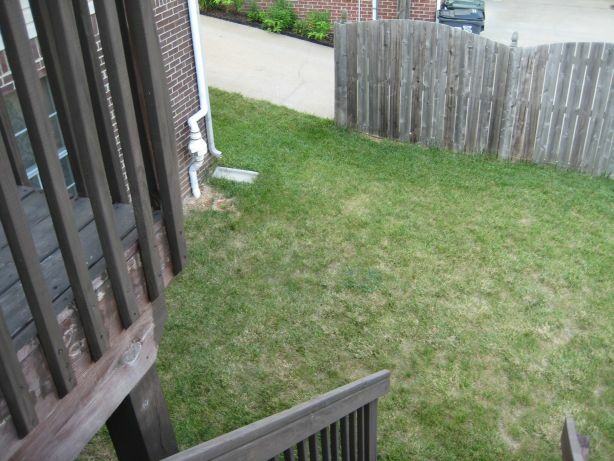 The back side of our house faces southeast, in the general direction of Boonesborough and Richmond, KY. 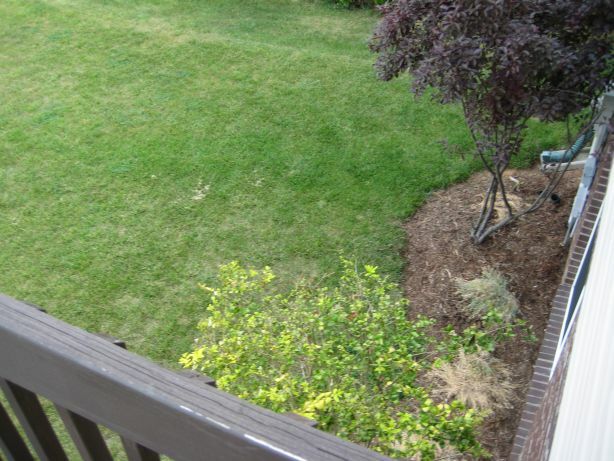 Here is the view, looking downwards and looking south. And here is the southeast view. As I mentioned in part I, we plan to build a fence eventually, on this and the southwest side. We probably won’t see the neighbor’s spruce trees after that, but the Colorado blue spruces Leive planted in the front yard will be prettier anyway. 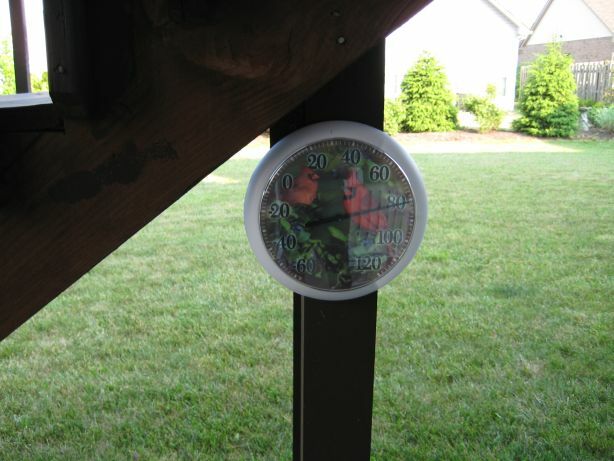 This is not very relevant, but here under the patio is a better shot of the cardinal thermometer, the one I told you we can see from the basement. 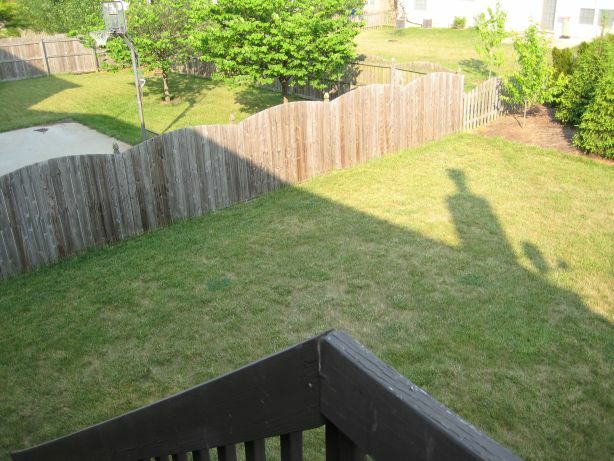 Update: In September 2007 we had a fence built to enclose the backyard completely. Click here to see the changes it made in the view. Next time: The main floor.